ARE YOU READY TO START YOUR OWN SKIN CARE BUSINESS? Is today the day that you take the first step towards creating your own brand? We can help. For almost a quarter of a century Vitelle Labs have been the manufacturing partner used and recommended by National Skincare Brands, Plastic Surgeons, Dermatologists and Esthetic Professionals. 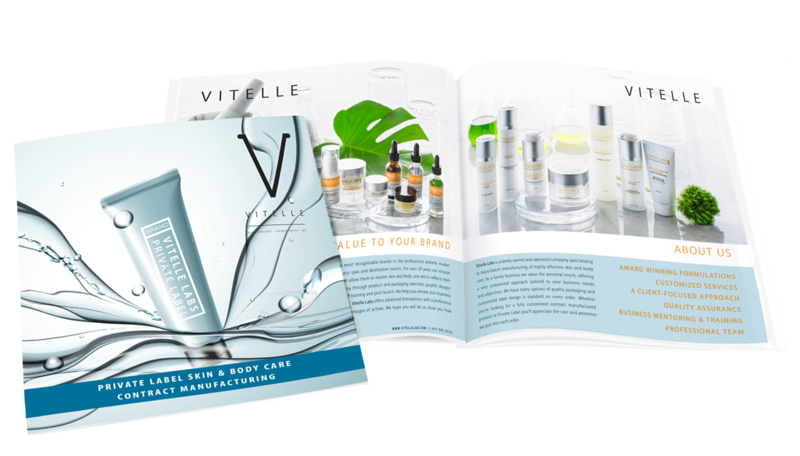 Vitelle is one of a handful of North American manufacturers who offer premium private label and contract manufacturing services to the professional skincare market. Vitelle works with clients of varying sizes to create unique, effective products sold in premium packaging and finely finished. Let us help you bring your brand to life! Vitelle manufactured products frequently receive industry awards for excellence. As a client you have access to our highly acclaimed portfolio of products. To ensure optimal freshness and potency we manufacture our products more frequently and in smaller batch sizes. Create your own formula. We will customize or create something special just for you – with minimums starting at only 20 litres. Eco-friendly manufacturing and a preference for plant derived ingredients appeal to savvy skincare consumers. WHAT PRODUCT SELECTION IS RIGHT FOR YOUR BUSINESS? Explore our product selection with your product specialist. Order samples for hands-on evaluation. Create your own unique brand presence by selecting packaging from our in-stock collections. Our experienced graphic artists help you create a label design that reflects your brand and practice. Use custom content such as product names and descriptions to enhance your brand presence. Place your order and leave the rest to us. Your products will arrive in 2-3 weeks fully labeled and ready to sell. We’re here to support you, with product training and the extras that enhance product sales and confidence.